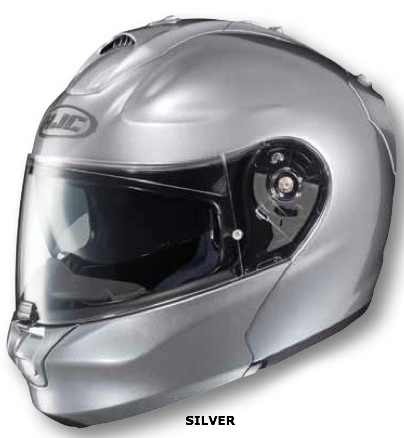 Brand new for early 2012, the HJC RP-Max Modular Helmet is the newest flip-up lid offering from HJC. Known as one of the leaders in the market for bang-for-the-buck modular helmets, the HJC lineup is great for riders out there with rounder head shapes. The brand new HJC RP Max Helmet uses HJC's PIM (premium integrated matrix) shell which is a robust blend of carbon fiber, aramid and fiberglass which is protective and also lightweight. HJC hit the CAD machine when they designed this and the result is a superb fitting helmet that is available in three shell sizes to ensure a proper and comfortable fitment. Using the ACS ventilation system, with chin and chimney intakes that feed rear exhausts, there is a high degree of airflow in the RP-Max Helmet. The chin intake actually shoots air directly to the shield to keep it fog-free when you're riding. Internally, the helmet liner and cheek pads are completely removable and washable. The COOL4EVER material is antibacterial and wicks moisture extremely efficiently. Additionally, there are cutouts to accommodate riders with eyeglasses. The chin bar features a single-touch open/close mechanism that makes it extraordinarily easy to operate with motorcycle gloves on. The new HJ-25 shield features posts for a Pinlock insert and the 100% fog-resistant Max Vision Pinlock lens is included. The RP Max uses the RapidFire shield replacement system which makes shield changes a cinch. This helmet also features a retractable sun visor for convenience. All in, we see this as a great value and look forward to getting our hands on one for a video review. Stay tuned.